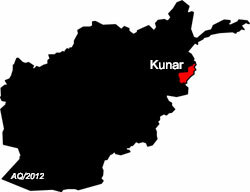 KABUL, April 21 (Xinhua) — Two police personnel were killed in a bomb attack in eastern Afghan province of Kunar on Thursday, police said. “Two Afghan Local Police (ALP) members died following an Improvised Explosive Device (IED) in Marawra District Thursday morning,” provincial police Chief Gen. Abdul Habib Sayyedkhel told Xinhua. The government established the ALP, or community police, in 2010 to protect villages and districts where army and police have limited presence. He blamed the Taliban militant group for the attack in the mountainous province bordering Pakistan. The Taliban militants, which ruled the country before they were ousted in late 2001, renewed armed insurgency, staging ambushes and suicide attacks, killing combatants as well as civilians. In northern Balkh province, four civilians were injured after an IED was detonated in a local bazaar in Dawlat Abad district at around mid-day, Shir Jan Durrani, a provincial police spokesman, told Xinhua. Among those injured were one woman and a child, he said. About 600 civilians were killed and more than 1,340 others wounded in conflict-related violence in first quarter of the year, said the UN mission in the country on Sunday. The UN has attributed 60 percent of the casualties to the Taliban and other insurgent groups, 19 percent were attributed to security forces while the rest 21 percent of civilian casualties were unattributed or caused by explosive remnants of war.